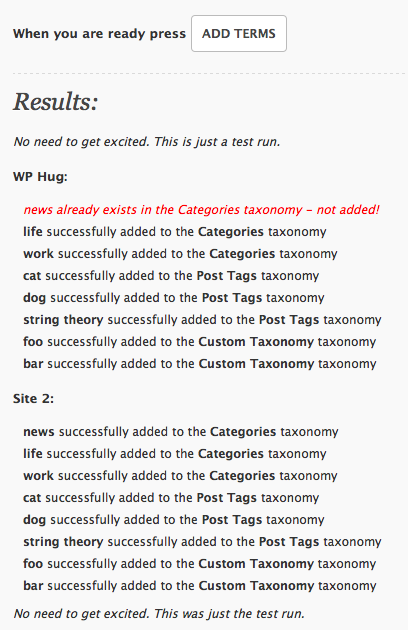 Setting up a WP multisite instance - the client has an existing ontology / set of categories that they want to classify all content across the set of blogs. Also the desire is that any new categories would be added at the 'network blog' level and synced to the other blogs. What's the best way of doing this? If you have a lot of blogs, this function may get pretty intensive. On average, we are running anywhere between 5 to 8 queries (possibly more) per blog - depending on the speed of your database, this function may need to be chunked. Only newly added categories are 'synced'. Updating and deleting categories are not (code will need to be revised). If a newly added category has a parent, and the parent cannot be found within the multisite blog in question, the category will be created with no parent (this should only be the case if the parent category was created before this function was installed). Give it a try. There's also a 'test run' feature implemented so you can check the result before actually doing something. I will come back and edit this with more info later (if needed). It is far from perfect (read known issues in the plugin head). TheDeadMedic's answer looks good, but I ended up taking a different approach to the problem. Instead of duplicating the same terms across the many sites, I instead made the other sites use the home site's tables for terms. This replaces the table name wp_2_terms with wp_terms, etc. You should of course check in your database to make sure of the exact name of the tables, which might be different if you change your prefix. It's only active on child sites that have the plugin activated. There's no way to enforce this from the parent site. It applies to all the taxonomies, not just selected ones. This approach is flexible - it can be adapted to pull categories from any blog, not just the central one. Not the answer you're looking for? Browse other questions tagged categories multisite globals or ask your own question. 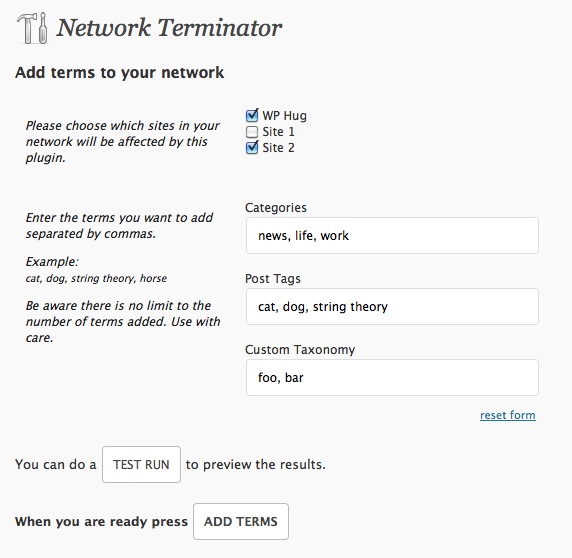 Wordpress: Can I add categories/tags to all sites in my network at once? Can Categories be used to hack a Multisite-like setup w/ a single MySql db? How the mu-plugins Folder Works in a Multisite Installation?